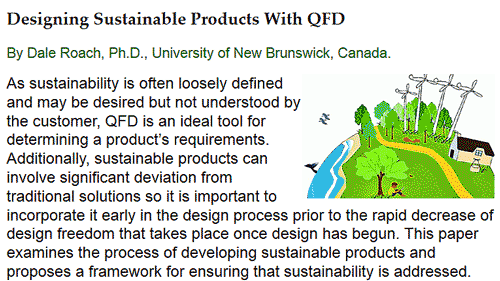 At the 2014 Symposium on QFD, Prof. Dale Roach of the University of New Brunswick and a QFD Green Belt®, presented a thoughtful paper on "Designing Sustainable Products with QFD." So useful was his approach, that the paper is cited in the soon-to-be-published ISO/TR 16355-8 as a reference to: "Section 18: Product end-of-life disposal, recycle, reuse, and other sustainability concerns." The concern for sustainability is too often treated as an 'either-or' tradeoff: You can have convenience or environmental friendliness, but not both. This tradeoff is common elsewhere such as with fast food — "you can have convenience or healthy, but not both." Oh really?? !! 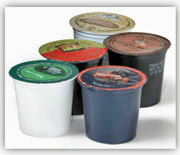 Let's take a popular example — the single serving K-Cup or Nespresso coffee cartridges. Each plastic and aluminum pod contains a single serving of coffee which you insert into the machine, push a button, and out comes fresh brewed coffee with the flavor, strength, and style described on the package. If you calculate the unit price for the few grams of coffee in each cartridge, this type of coffee brewing comes to about $50 per pound, regardless of the brand. "... coffee pods cause unnecessary resource consumption and waste generation... They (the city) simply cannot justify buying 6 grams of coffee wrapped in 3 grams of packaging with taxpayer money. The city aims to cut down on packaging waste in general - whether it can be recycled or not." What can QFD do about this dilemma? First, do not mix sustainability concerns with customer needs. As with cost, reliability, and similar issues, QFD treats these as design constraints, which are on the product side of QFD, not the customer side. Of course, customers these days talk about environmental sustainability, but these "voices" must first undergo analysis. When properly done, this analysis reveals that Sustainability, like cost and reliability in Yoji Akao's Comprehensive QFD, should have its own set of deployments during the design phase. Second, these deployments should be done in a flow-down of matrices that include system design, components, processes, packaging, retirement, and others. This assures that the entire design from marketing collateral, to product, to packaging, to shipping, to retirement are examined for sustainability issues. If you're doing Blitz QFD®, the Maximum Value table can be supplemented with an Environmental Value table if there are only 3-5 sustainability issues. In order to properly position "sustainability voices," your voice of customer analysis must be sound. These pre-matrix steps were not part of the classical methods, so it is crucial to get proper training even if you're familiar with the House of Quality matrix or 4-phase model. Update your matrix math, so that ordinal scale calculation errors do not cascade from one matrix / deployment to the next. For the most time and cost efficient way to learn how to integrate Sustainability successfully, consider attending the QFD Black Belt® program. You will get step-by-step hands-on training; if you'd like, you can work on your real project in the classroom under the guidance of the experienced instructor. Your outdated House of Quality and 4-phase approach ruining innovation?